Hello blogging friends! Today, I have an 8 x 8 layout to share with you. Can you guess who is in the picture? LOL! If you guessed that it's me in the photo then you are right. 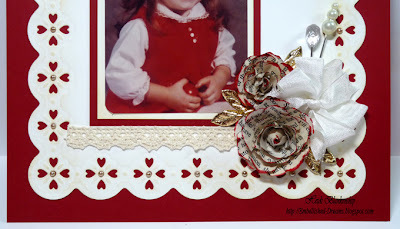 :-) I used LF-127 Grand Scalloped Squares and then I was happily surprised to find out that one of the Decorative Inserts from E8-005 Classic Postage Stamp matched up perfectly with the scallops in the square! Here is a close up of the border. I added pearls to the center of each grouping of hearts. I added a piece of Penelope Natural Crochet Lace Trim from Really Reasonable Ribbon. 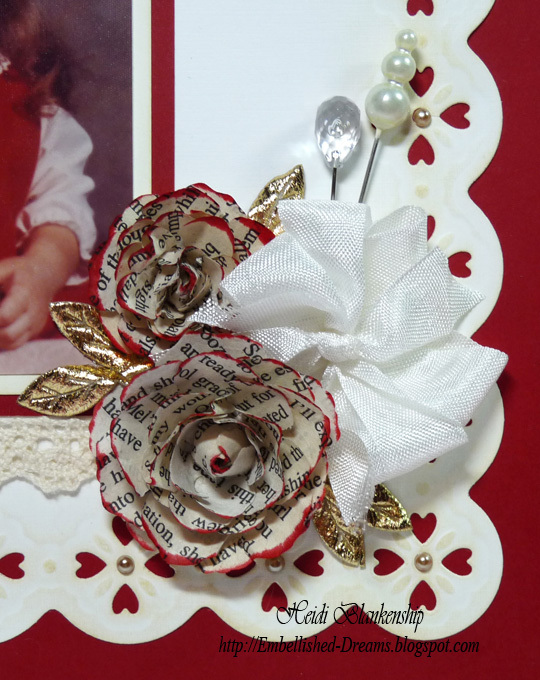 Then I made two roses using S5-050 Rose Creations and old book pages. I edged the roses with Festive Berries Distress Ink. I added some Gold Leaf Trim from Really Reasonable Ribbon, a couple of trinket pins and a seam binding bow. Hello blogging friends! I have another Christmas card to share with you, using Dark Red Baronial Scored Card & Envelope Pack 6 x 6, Posh Hemlock Felt, Bazzil Salt Dotted Swiss from Discount Cardstock. 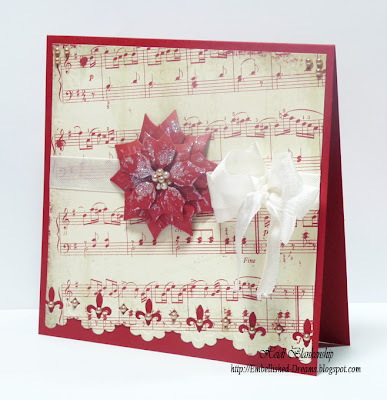 This week the Dark Red Baronial Scored Card & Envelope Pack 6 x 6 is on sale at Discount Cardstock--check out the great deals on cardstock! 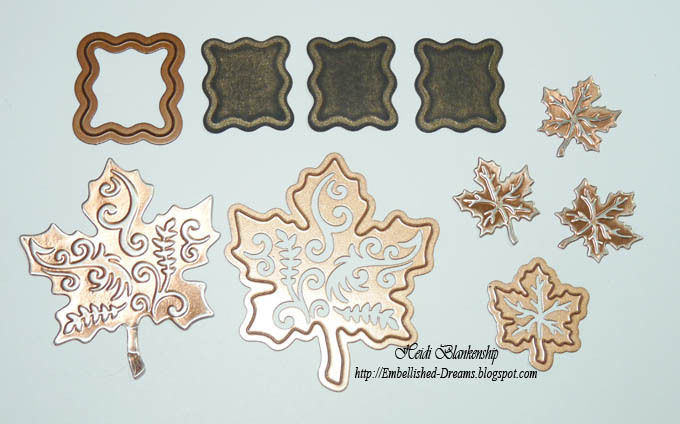 I also used S4-346 Labels Twenty-Two, S4-338 Holiday Tags, S5-056 Holly Accents, S5-057 Holly Motifs die templates from Spellbinders. I lightly rubbed my Brilliance Galaxy Gold over all of the S5-056 Holly Accents and S5-057 Holly Motifs die cuts to make the embossing really pop. Next I added Baby Bling Red Rhinestones from Want2Scrap. 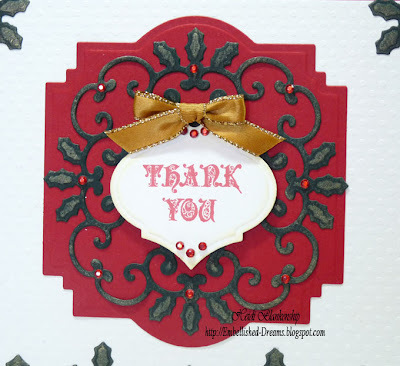 To finish off the card I stamped the Thank You sentiment on the little ornament die cut using CR-02225 Autumn Words from JustRite Stampers and then I added a gold bow at the top using Gold & Silver Ribbon November Kit from Really Reasonable Ribbon. Hello blogging friends! 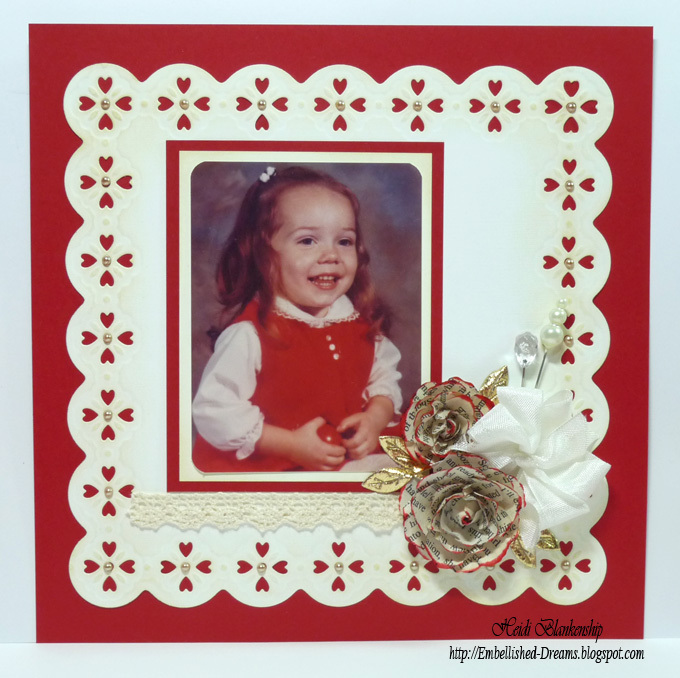 Today, I have a quick and easy Christmas/holiday card to share with you. As a matter of fact it's SO quick and easy I don't really have any details to add--LOL! Hello blogging friends! Omgosh it so cold out today and it looks like it could snow! So far we have been lucky and avoided most of the snow, other then a light dusting about a week ago. 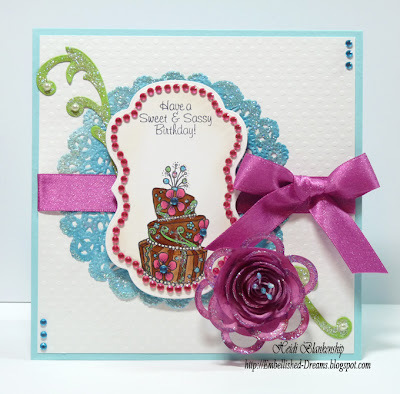 To start I used S4-351 Spiral Blossom One and the Grand Calibur along with Premium Craft Foils Delicate Pastels Pink from Spellbinders to cut the die cut shape. 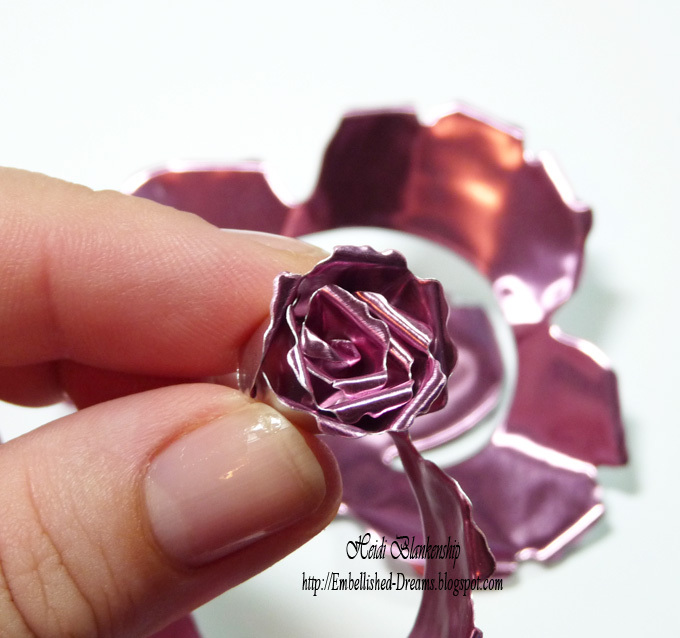 Then I used my paper piercer to roll or curl the edges or each petal on the foil die cut shape. This is what the die cut looked like when I started to roll the edges. 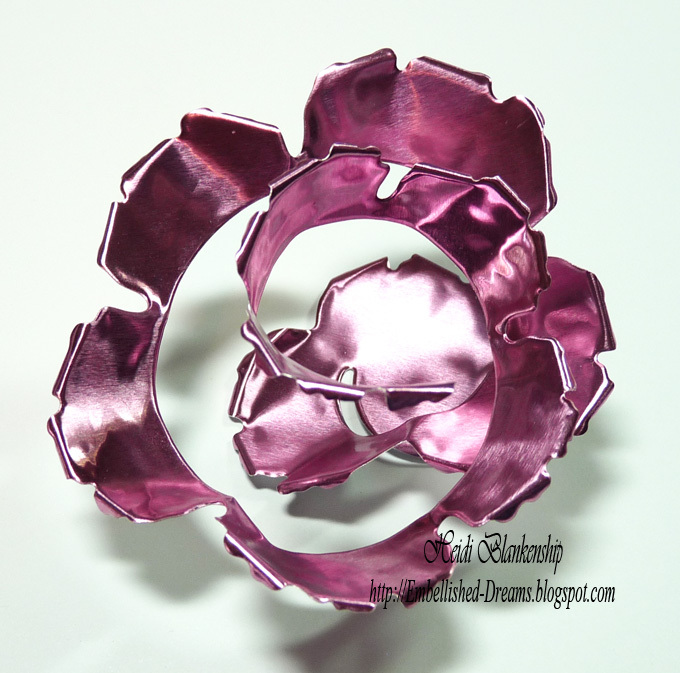 Once I was finished rolling all of the petals this is what the die cut looked like. Next I started to roll the foil die cut into the shape of a rose. While doing this I made sure not to roll it too tightly. 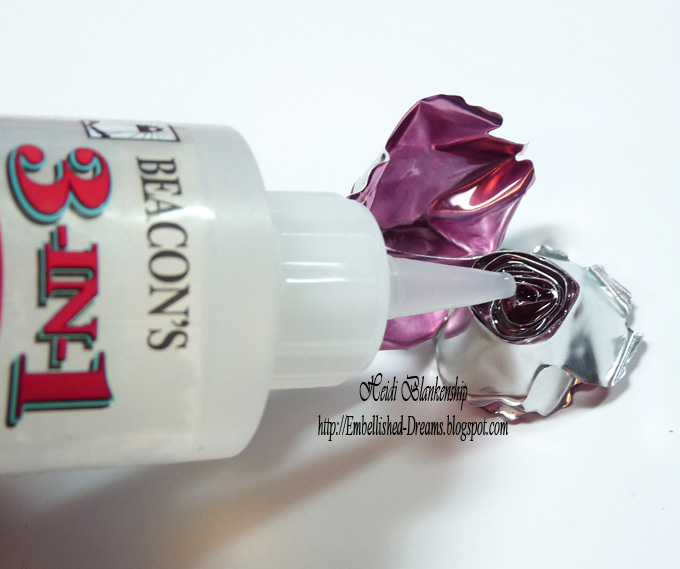 Then I used 3-in-1 Advanced Craft Glue from Beacon Adhesives to glue the bottom in place. 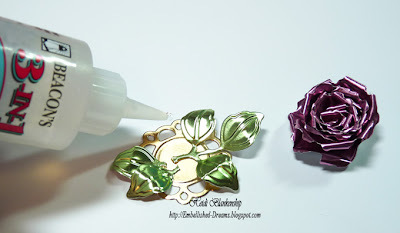 I wanted to add some leaves and I also needed a base for my pin so I used S4-328 Foliage and S4-345 Picot Edge Circles to create my die cuts. 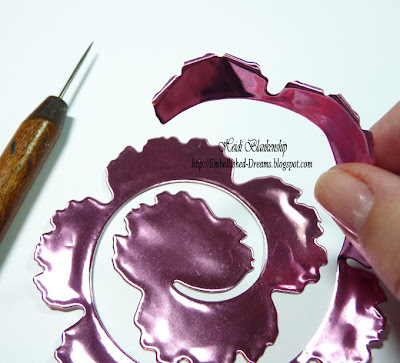 As you can see from the photo I cut the leaf die cut into three pieces. 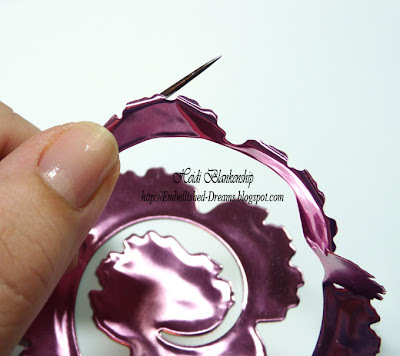 Using 3-in-1 Advanced Craft Glue I started to assemble the decorative pin. Here is a close up picture once all of the pieces were glued together. 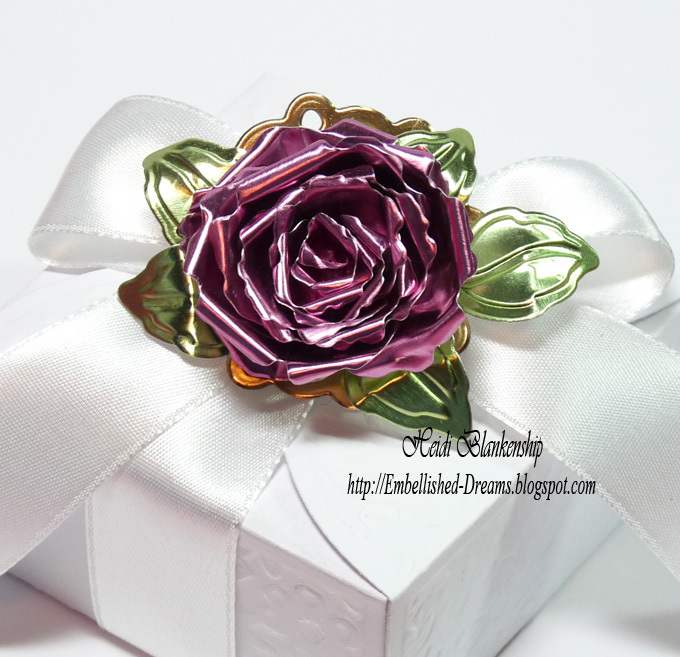 I glued a pin back on the backside of the foil rose and and used it to embellish the little gift box. 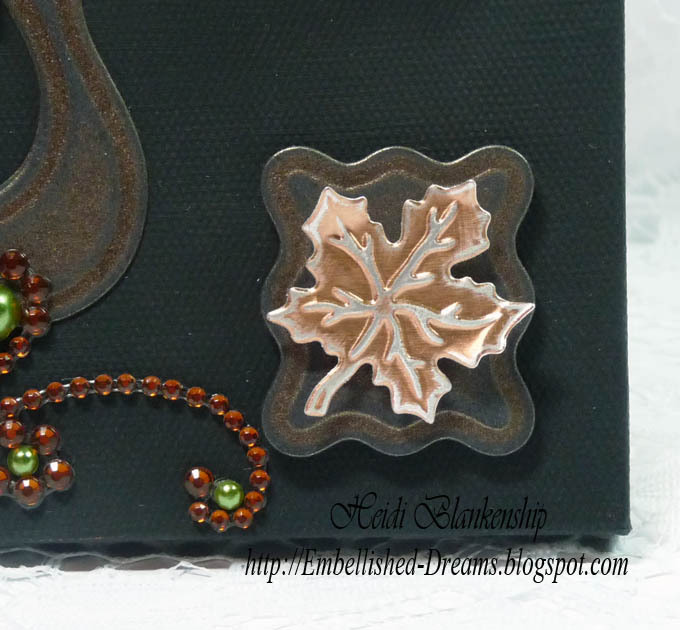 To create the box I used Simply Smooth White cardstock from Discount Cardstock, LF-012 Square Petal Top Box and GI-004 Fancy Flourish Grand Impressabilities from Spellbinders. 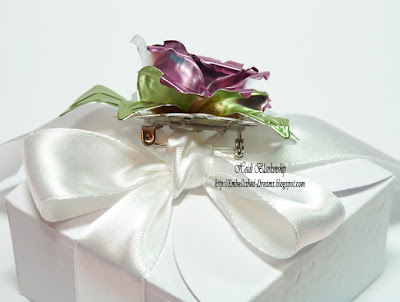 Then I used a pretty white ribbon to make a bow on top of the box. Thank you so much for stopping by today! Now I have to go and start on supper--we are having Creamy Cheesy Wild Rice Soup--Yummo!! I usually add chicken to the soup but we have a lot of leftover turkey so that's going on the soup. I hope you have a great rest of the weekend!! Hello blogging friends! I hope you all had a wonderful Thanksgiving with your family and friends!! Did you go out and do some shopping on Black Friday or did you just stay home? We didn't go out to do any shopping but we did get some great deals on a few online purchases. 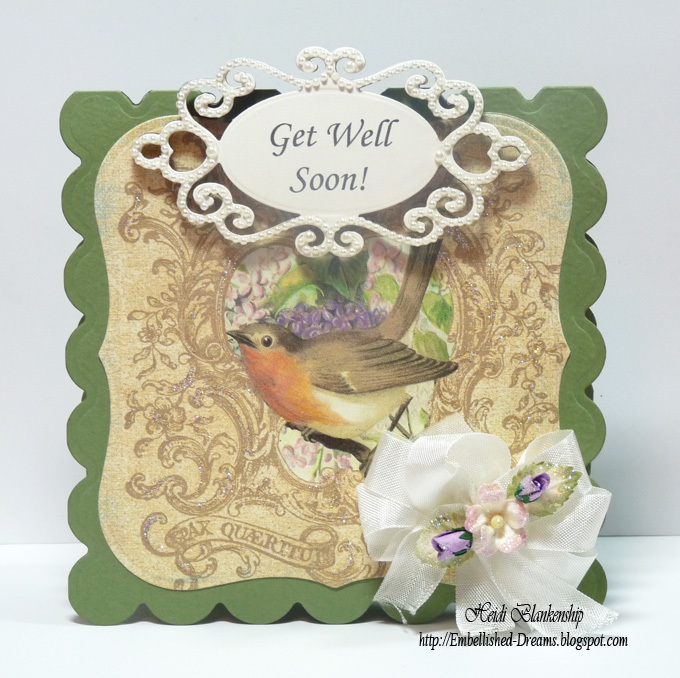 Today, I have a Get Well card to share with you. The card is for the wife of one of Eric's co-workers. She has been in the hospital. I hope she will have a speedy recovery and feel up to coming the the company Christmas party in a few weeks. 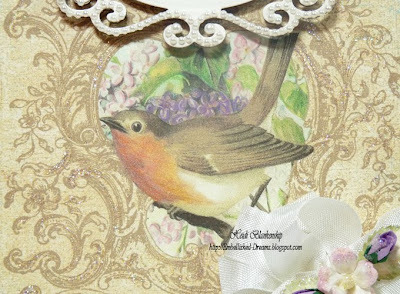 I used one of the images from the new Crafty Secrets CD #2 Creating With Vintage Illustrations. I think the image of the little bird and flowers is so pretty. I wanted the bird and the flowers to really pop so I added a little more color to the image with Prismacolor Colored Pencils. 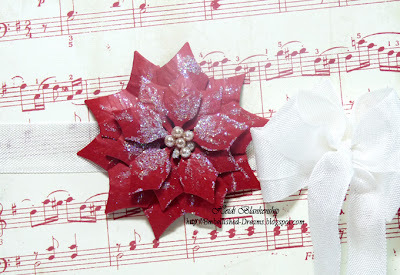 I also added a little Pralines & Cream Fairy Dust Glitter from Clearsnap to the flourishes. 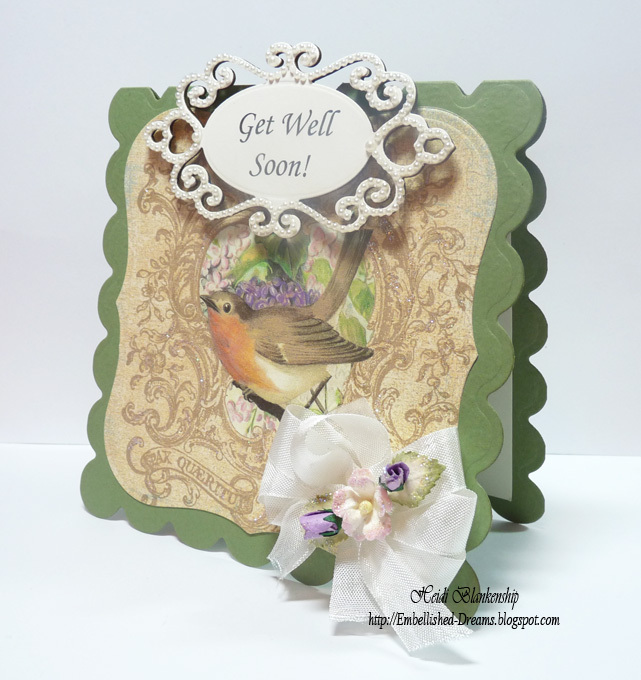 I printed the sentiment onto Simply Smooth Ivory cardstock and used S5-030 Fancy Tags Two to cut/emboss the die cut shape. Then I layered the diecut, Fancy Tags Two Nestaboard and Fancy Tags Two White Pearl Nestabling from Want2Scrap. I used 3D Foam Squares from Scrapbook Adhesives by 3L to pop up the tag. I added a seam binding bow and some paper flowers from Wild Orchid Crafts. Then I added a little glitter to the flowers. To create the shape card I used LF-127 Grand Scalloped Squares and for the image of the bird I used LF-161 Grand Labels One die templates from Spellbinders™. Thank you so much for stopping by today! I hope everyone is enjoying the holiday weekend. How many of you already have your trees up and house decorated? We still need to do ours but hopefully we will get the tree put up and all of the decorating done this week. I hope you all have a Happy and Blessed Thanksgiving Day with your family and friends!! 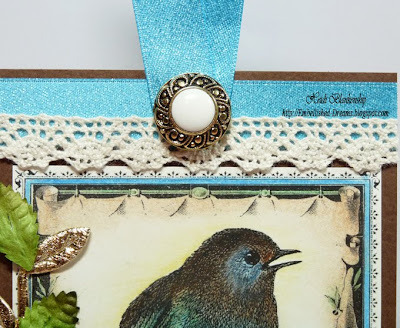 I have a quick post for today and a tag to share with you using the New CD Creating With Vintage Illustrations from Crafty Secrets. I love the image of this fairy! 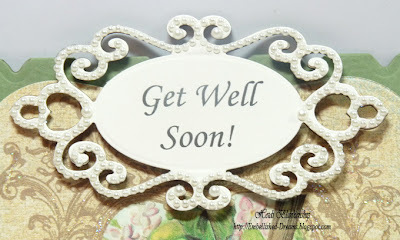 from Want2Scrap and Pralines and Cream Fairy Dust Glitter from Clearsnap. 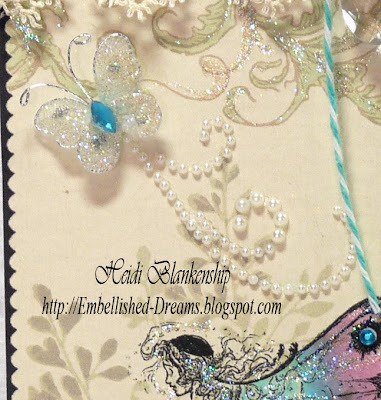 I added a Butterfly and a small piece of Finesse Swirls White Pearl from Want2Scrap. 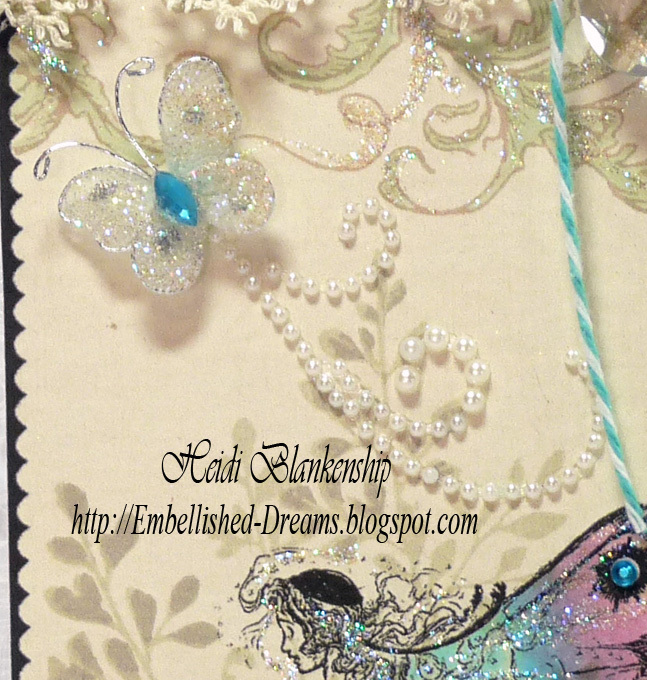 I added a little more color to the top of the tag with Copic markers and some sparkle with more glitter. To finish off the top of the tag I added some vintage lace trim, twine, tulle, ribbon, a paper flower and a crystal. 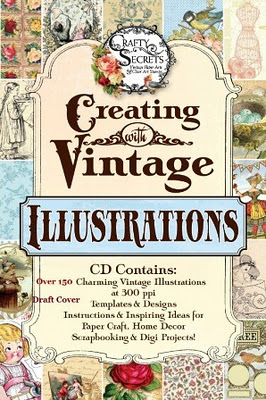 Please be sure to check out all of the fantastic samples by the Crafty Secrets DT on the Heartwarming Vintage Blog and also on their own personal blogs using the New CD Creating With Vintage Illustrations! Thank you so much for stopping by today. It's chilly outside but the sun is shinning. I am feeling pretty good today and it's a beautiful day--I hope you have a beautiful day too!! Good morning blogging friends! Before I get started with my projects today (yes, I have some artwork to share!) I want to say a HUGE Thank You to all of you for all of the wonderful comments, emails and phone calls!! Thank you for all of your thoughts, prayers, links, information about books, home remedies and all of your support!!! It means SO much to me!!! I haven't been on the computer much the past several days, I have just been taking it easy and trying to relax and feel better but I have been reading through all of your wonderful emails. Thank You!! Thank You!! THANK YOU!!!!! I also want to say I guess I was kind of surprised with all the emails from people who also have RA (in the crafting industry), or friends and family who suffer from RA and other diseases that are similar. I want you to know that I am keeping you all in my thoughts and prayers. Yesterday, I was feeling a little better so last night I sat down to do a little creating. Luckily the past few weeks I was working ahead on several projects so I will still be able to have artwork to post while I am working on feeling better and getting my medication regulated. 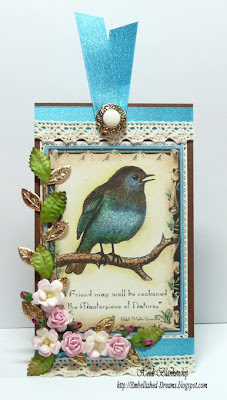 Sandy from Crafty Secrets made some Big Announcements yesterday on the Heartwarming Vintage Blog! She is releasing a second CD, Creating With Vintage Illustrations. You can pre-order the CD or it will be available for Black Friday. The CD is filled with over 200 files and let me tell you the images are Beautiful!! 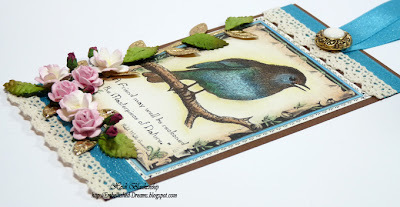 All this week the Crafty Secrets DT will be sharing projects made using the New CD on their blogs. 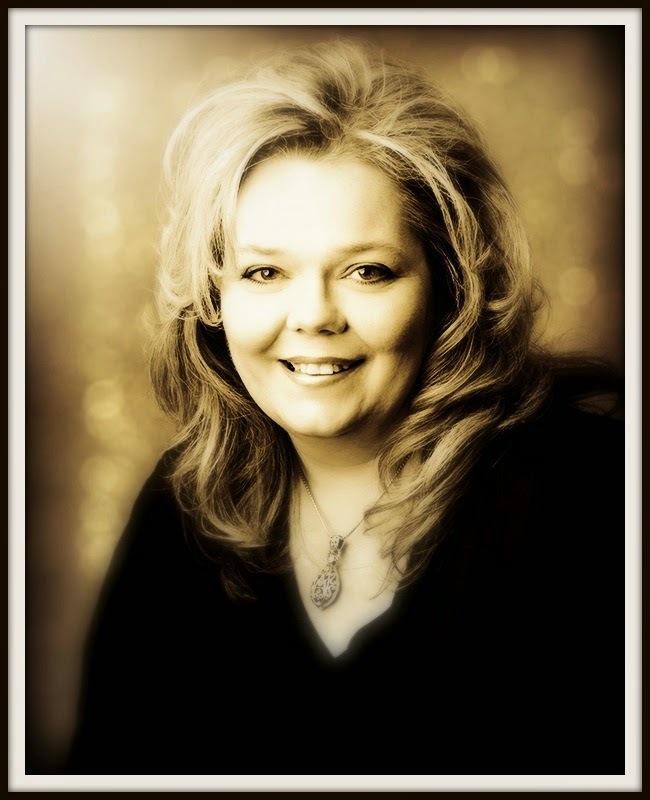 Sandy also has another great announcement so be sure to click HERE for all of the details. I think the best thing about having digital images is that you have so many choices--and we all LOVE to have choices, right? LOL! 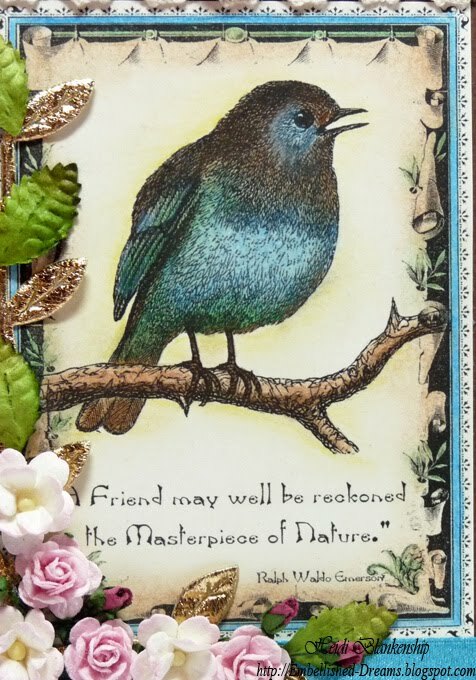 Here is one of the projects I made using an image from the New CD2 Creating With Vintage Illustrations. 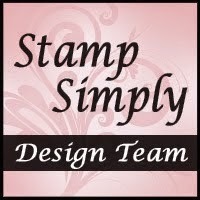 I printed the image on Simply Smooth Ivory from Discount Cardstock. Then I used a pointed q-tip and baby oil to do the blending and I was very happily surprised at how easy the colors blend. Now I am going to want all the colors!! 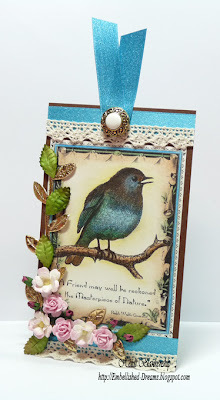 I layered the colored image on to a piece of Posh Milk Chocolate Felt from Discount Cardstock and then embellished the tag. 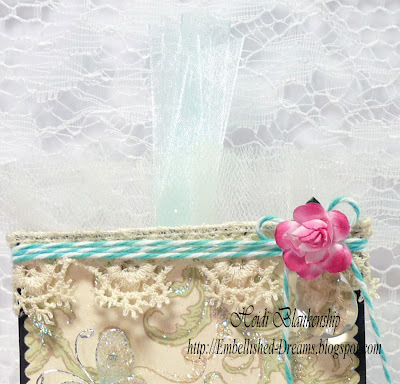 The ribbon is from the Shimmer Satin Bright Assortment and I also used Penelope Natural Crochet Lace from Really Reasonable Ribbon. I also added a vintage button at the top. Along the bottom I added Gold Leaf trim from RRR and 2-Tone Baby Pink Sweetheart Blossom, 5/8'' Baby Pink Open Roses, 1/8'' Burgundy Closed Rose Buds from Wild Orchid Crafts. 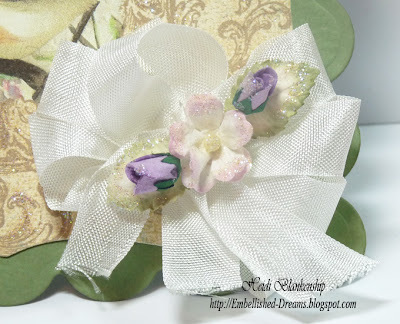 I just received my first order from Wild Orchid Crafts and I LOVE their products!! I also added a few tiny green leaves from I Am Roses to mix in with the gold leaf trim and paper flowers. Thank you so much for stopping by today! I hope you have a wonderful day and things don't get too crazy for everyone trying to get ready for the Thanksgiving holiday. Good morning blogging friends. I am sorry I don't have any artwork or tutorials for you today. I tend not to share a whole lot of personal stuff on my blog but you are all such wonderful and loyal followers and I just feel that I need to share this. A few of my close friends know that I have RA but I tend not to talk about it or dwell on it much because it is something that over the past few years is just a part or my life and something I have had to learn to deal with. I started noticing changes a while ago and things have increasingly become worse. When I was first diagnosed with RA about 4 1/2 years ago it was just in my left shoulder and arm and now it is throughout my body. My biggest fear was getting it in my hands. I use my hands all the time to create and my hands are my job. Unfortunately this past year it has moved into my hands. So I have been dealing with all of the physical changes over the past few years. I have good days and bad days but recently I have been having a lot of issues and a lot of pain. I have been seeing my doctor and he told me that yes a lot of the pain is from the RA but he also thinks that I have to much on my plate and a lot of the pain is being brought on by stress. Also some of my numbers from tests and blood pressure are really high, which isn't good. Sometimes things happen in our lives that really force us to take a look at the big picture and sometimes that forces us to make some tough choices. Following the advice of my doctor I am making some changes in my life and trying to lessen the stress level. I have made the decision to step back from some things in my creative life. Please don't worry I will still be here creating--my creativity is SO important to me!! But I am having to step back from somethings to lighten the load. My RA is nothing that can't be handled but like I said it is forcing me to make some tough choices. Thank you for letting me share and thank you for stopping by today. Good morning blogging friends! Today I have a fun, bright and cheery birthday card to share with you. 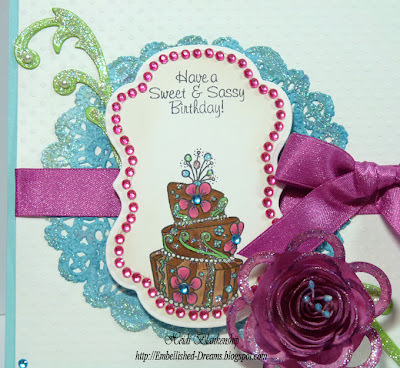 Personal, I am not usually one for the brighter colors but I had so much fun coloring this CR-02230 Toppsy Turvy Cake image from JustRite and adding all of the pretty and colorful bling from Want2Scrap®. 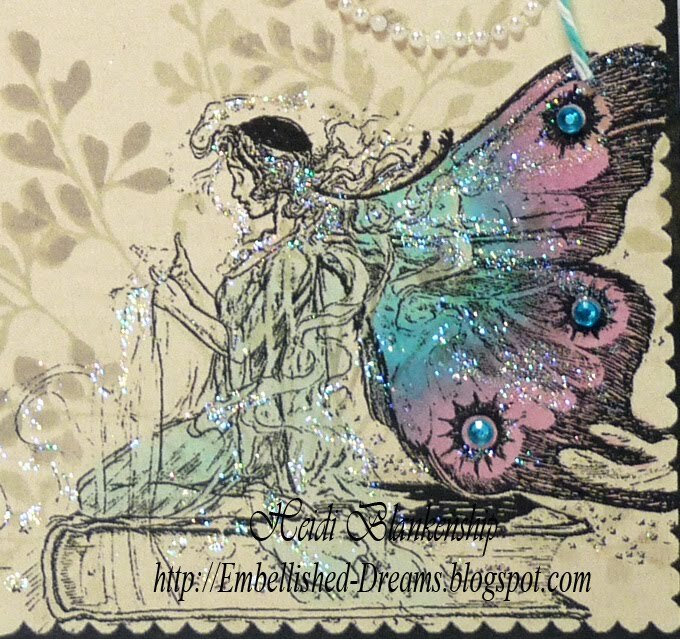 I used Copic markers to color the image and then used Spellbinders™ Grand Calibur Die Cutting Machine and S4- Labels Fourteen to cut/emboss the shape. Then I layered the die cut, Nestaboard Labels Fourteen and Nestabling Labels Fourteen Hot Pink Rhinestones. I colored the paper doily with glimmer mist and added some die cut accent pieces from S5-071 Twisted Metal Tags & Accents. For the rose I used S4-352 Spiral Blossom Two from Spellbinders. 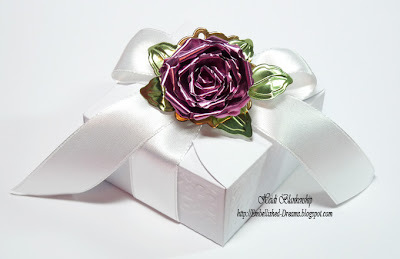 Once the rose was rolled I added glimmer mist and glitter to match the Nestabling and Ribbon. 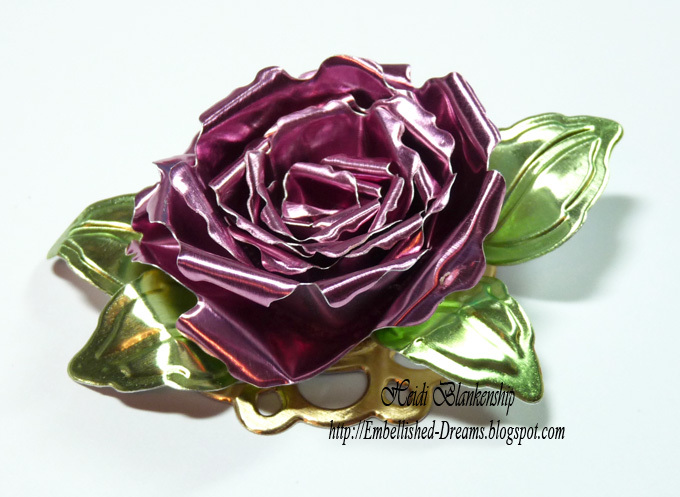 The ribbon is from the Shimmer Satin Bright Assortment from Really Reasonable Ribbon. 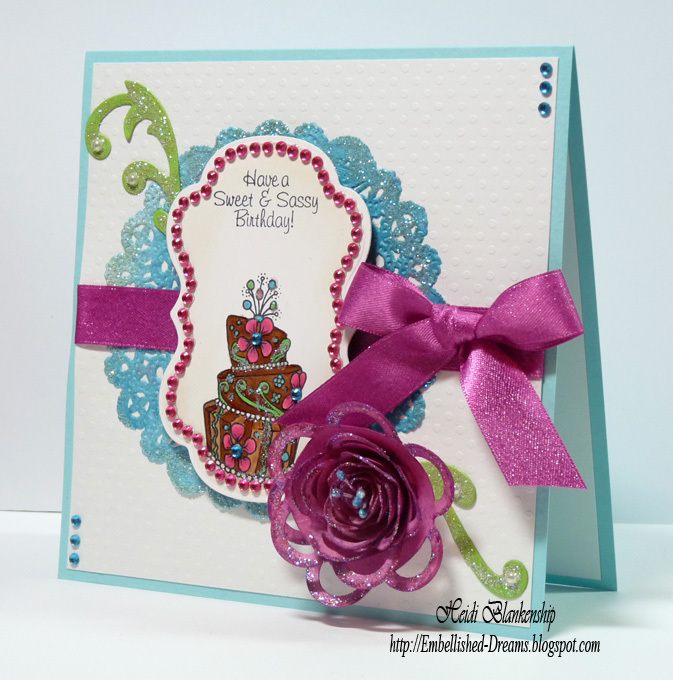 I also added some Baby Bling Turquoise Rhinestones to the cake and corners of the card and Baby Bling White Pearls to the swirl die cut accents. These new dies are in stock! Get yours now at a participating Crafters Home store! 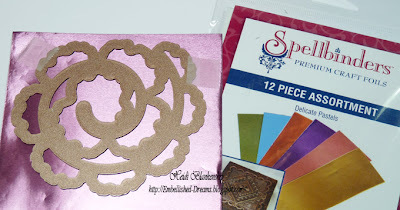 Please see the Spellbinders Blog for the list of participating stores. Visit the Spellbinders Blog November 14 - 16 to see a new Spellbinders die template revealed each day! Visit designer blogs to enter the daily contests and see inspiring projects using the new releases. 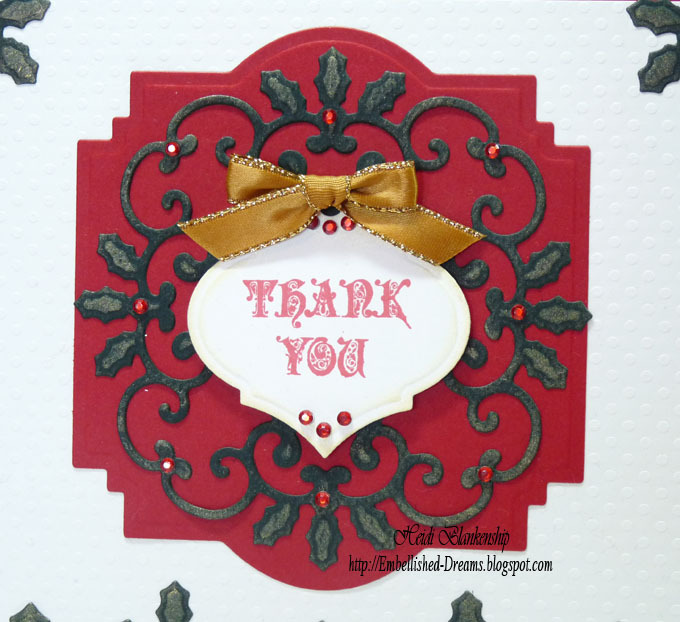 Comment on Designers Blogs and the Spellbinders Blog count as entries into daily drawings. Daily winners receive all three of the new designs! For my project I designed an altered Autumn canvas and matching card ensemble using the NEW S4-341 Wavy Rectangles, S4-346 Labels Twenty-Two and Precious Metals Premium Craft Foil (copper) from Spellbinders. 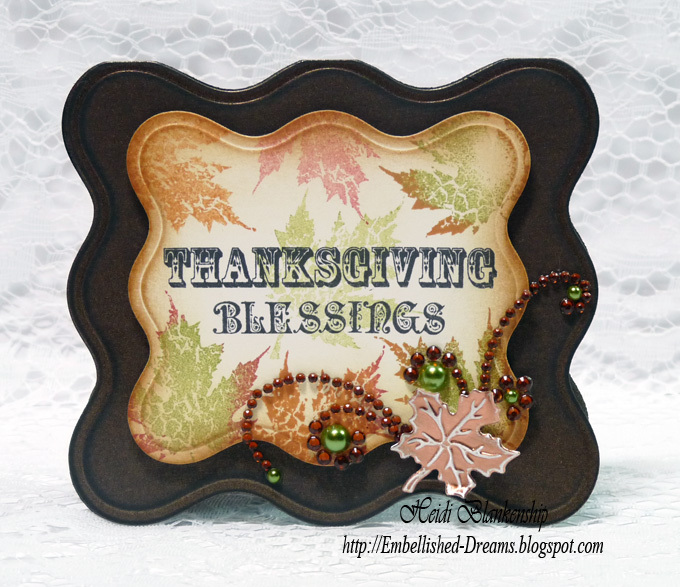 This would make a perfect hostess gift for the upcoming Thanksgiving holiday. I started with a white 6 x 6 canvas that I picked up at the dollar store. I used Black ECO-Friendly Acrylic Paint from ECO Green Crafts to paint the entire canvas. 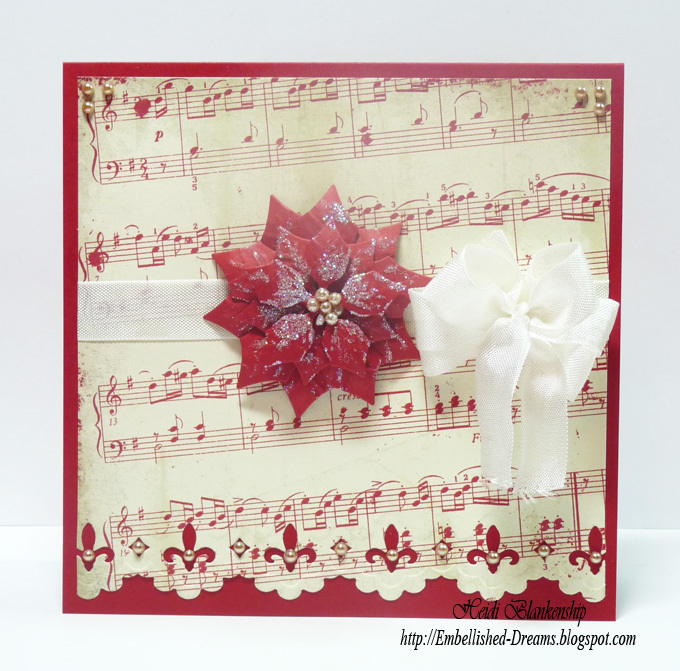 Next I used the S4-341 Wavy Rectangles #4 and #5 to create the fame die cut. I lined up the die templates and used some removable tape to hold in place while cutting/embossing with the Grand Calibur. Once I cut/embossed the frame then I lightly sanded the paper. I used Bronze Metallic paper from Discount Cardstock. 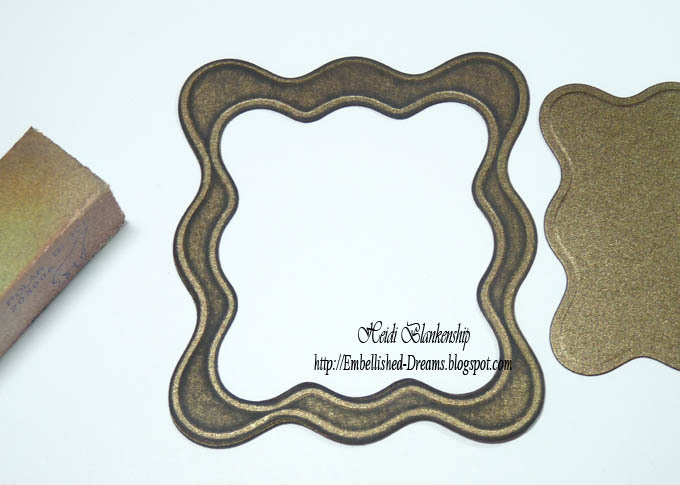 I love the look that is achieved when sanding the Bronze Metallic paper, the under tones of the black really pop. 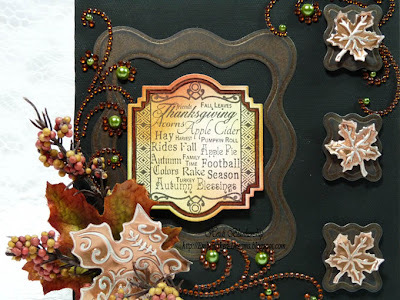 To create the other die cuts I used S4-341 Wavy Rectangles #2 and S5-073 Orchard Harvest Tags & Accents. 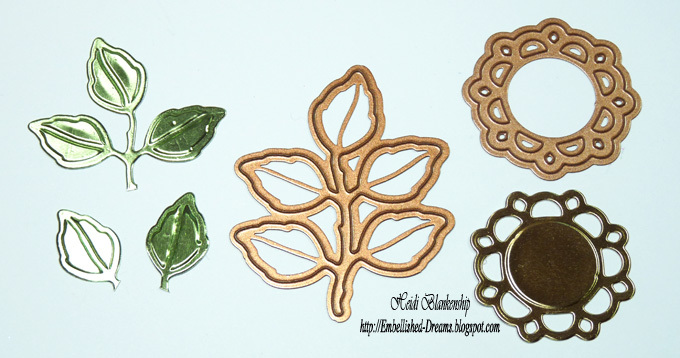 For the leaves I used Precious Metals Premium Craft Foil (copper) from Spellbinders and lightly sanded all of the pieces. 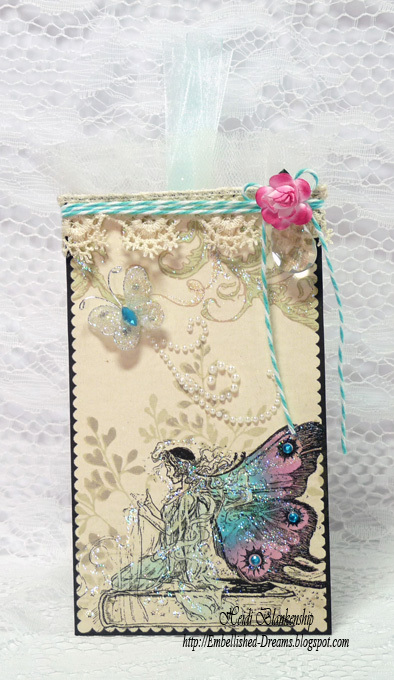 I used 3D Foam Squares from Scrapbook Adhesives by 3L to layer the die cuts along the side of the canvas. For the stamped image I used Tsukineko Memento Tuxedo Black ink and CL-02200 Autumn Labels Twenty-Two from JustRite. 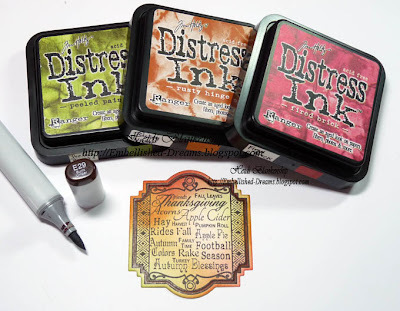 I used S4-346 Labels Twenty-Two to create the die cut. Then I used Ranger Peeled Paint, Rusty Hinge and Fired Brick Distress Inks to add color to the image. 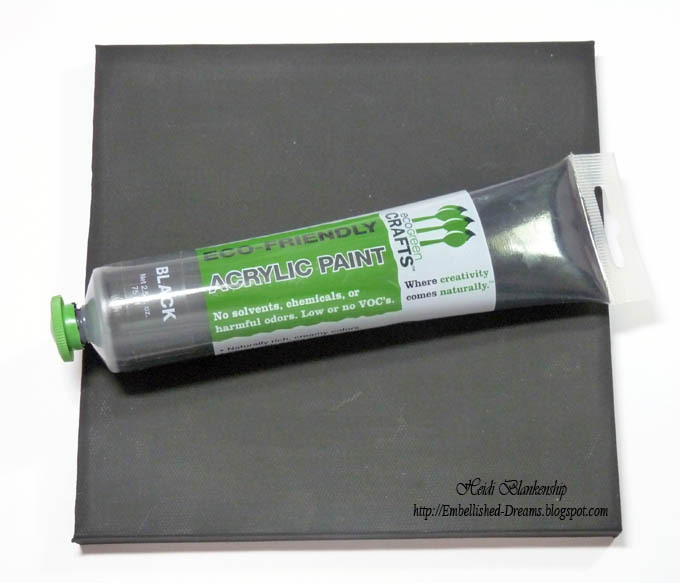 The border was colored using Copic Marker E29 Burnt Umber. 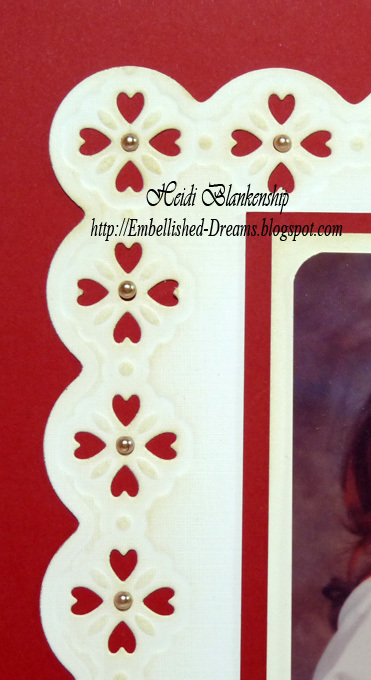 Once all of the die cuts were layered and added to the canvas then I added the embellishments. 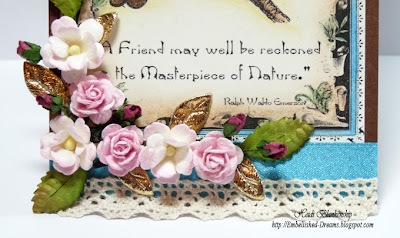 I used Finesse Swirls Brown Rhinestones and 72 Count Sage Green Pearls from Want2Scrap® and also added some berries and a silk leaf. For the card I used several of the same supplies as the canvas. 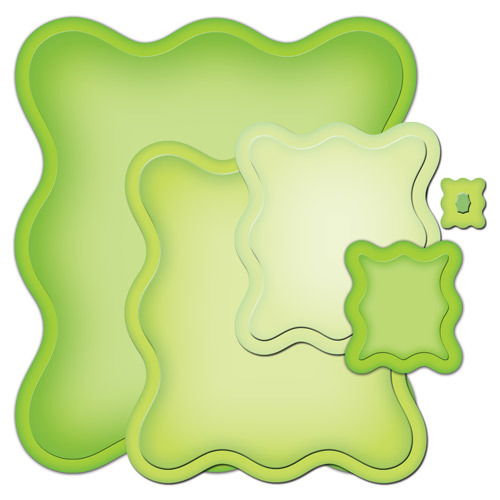 I used S4-341 Wavy Rectangles to create a shape card. For the stamp set I used CR-02225 Autumn Words from JustRite. • The Fall Sneak Peek starts November 14, and ends November 16, 2011. It consists of three individual contests, one each day. • Each Fall Sneak Peek Bog will accept comments as entries from 12:00 am until 11:59 pm Eastern Standard Time, on its scheduled day. • Each comment counts as one entry. One entry per person, per blog please. 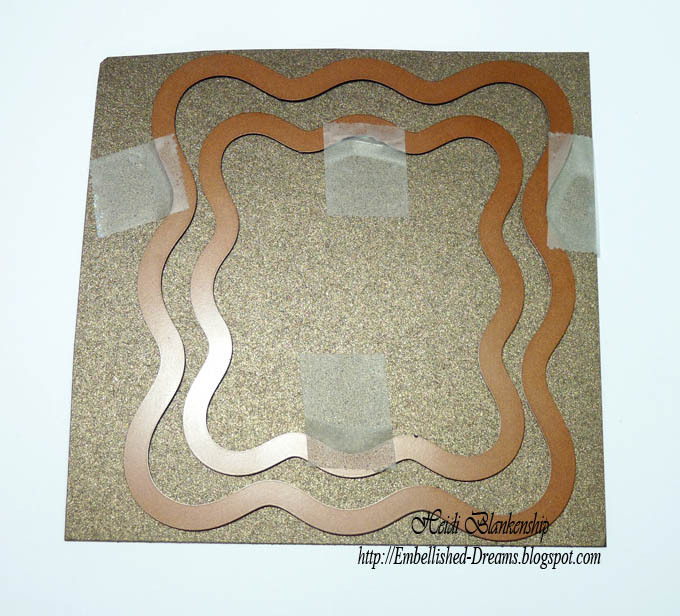 • One winner each day will receive the three new die templates available exclusively at Crafters Home stores. 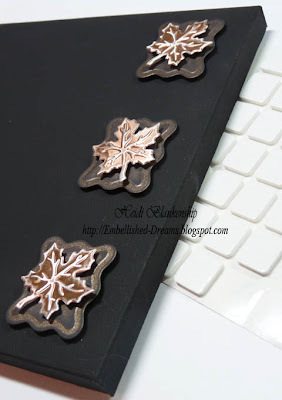 • All three winners will be announced on the Spellbinders Blog on November 17. The winners will have 48 hours to respond to the email address on the winning post to claim their prize. If a winner fails to respond within 48 hours, a new winner will be drawn. • By entering, you allow Spellbinders to publish your first name, city, state, and country of residence and a quote from you, on the Spellbinders Blog, website, and in promotional materials. • Spellbinders Designers, contractors, employees and immediate family members are not eligible to win. • The invitation to the Fall Sneak Peek Blog Hop is extended to all, we are happy to ship prizes worldwide.